This week has been a busy week when you add in the fact that JP has been home with me all week for Thanksgiving break. Getting out the door for errand running takes a little longer and keeping the house in shape is near impossible. This is why I like to use easy meals as shortcuts wherever I can – you know, mom hacks! 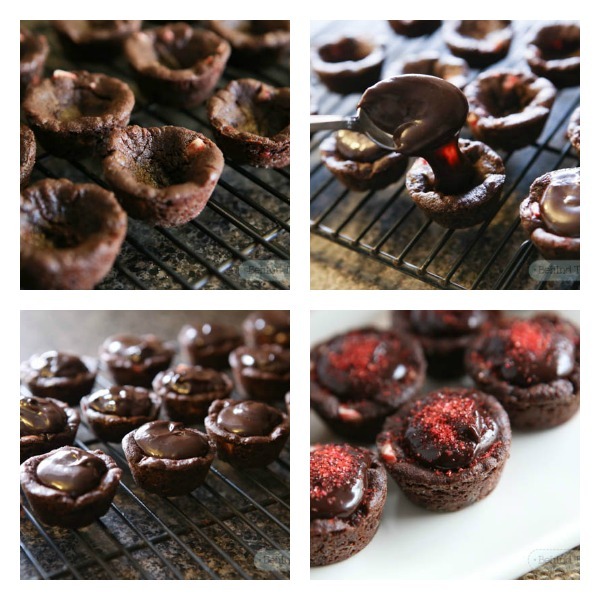 I made some yummy chocolate peppermint cups with just a few simple ingredients.. Using a package of Nestle chocolate peppermint cookie dough, I made little chocolate cups to be filled with chocolate ganache. In a buttered & floured mini cupcake pan, I flattened each square and filled it in each hole. Make sure you create a well in the middle of each one so to make sure you have space to fill it once its cooled. Once I had them all filled, I popped it in the oven and baked it according to the package directions. Melt the chocolate chips in a double boiler, or be like me and use a metal bowl over a pot of boiling water. Add in the heavy cream and coffee granules and keep stirring until its smooth and silky. Set it aside and let it cool off a little. By the time you’re done with the ganache, the cups are ready to come out of the oven. TIP: you can poke the centers down once they come out of the oven to help make that hole you need. I used the back of a spoon to gently shape it. Then, its best to leave them in the pan cooling for an extra 2 minutes or they will crumble and break easily as you try to pull them out. I used a knife on the side to help lift it out carefully. Let them cool completely on a cooling rack before filling them. Fill each one with the chocolate ganache you just made and garnish with sprinkles. Store them in an airtight container. So because I offered to bring one of my easy meals to the Thanksgiving dinner my mother-in-law put on, I needed something both easy and delicious that was a crowd pleaser. STOUFFER’S® Lasagna seemed to be a great option when I was at Walmart the other day, along with some other sweet treats as well – so there would be something other than turkey and pumpkin pie to indulge in. I got everything I needed for holiday entertaining at Walmart – the lasagna was in the frozen food section, and the cookie dough was found in the open chest freezer near the dairy section and I even got some NESTLÉ® TOLL HOUSE® Rolled and Ready cookie dough to make and decorate sugar cookies with. Thanksgiving is an all-day affair with our family and it begins with the traditional turkey dinner for lunch, then we watch the Cowboys play football while everyone does their respective thing (the women drink coffee and look through the black Friday advertisements, and the men watch the game) then before long, everyone is hungry again! This is where the Lasagna comes into play – it takes a good while to cook, so I popped it in the oven right after kickoff so it was ready just in time for the evening games. The party size tray was able to accommodate everyone who wanted some with plenty left over. JP and I has a great time while he was off school decorating and baking some Christmas cookies. Using the NESTLÉ® TOLL HOUSE® Rolled & Ready Sugar Cookie Dough Sheets made my life soooo much easier! Truthfully, JP isn’t so interested in making the dough – he’s more interested in the cookies once they are ready for decorating. The pre-rolled dough just allows me to skip to the fun part, which is awesome when you have to entertain a 5 year old all week! We made a great decorating team – I sprinkled them with red & green sugar and JP put the candy eyes on the gingerbread men. I even made some more NESTLÉ® TOLL HOUSE® Dark Chocolate Peppermint cookies because the cups were so good, I wanted to see what they were like as regular cookies. All we did was break them apart and space them out on the cookie sheet. One they were all baked, we were ready to indulge with a big glass of milk. Methinks that we may do this again when Santa comes to visit! Sometimes I need help being supermom, and I think with the help of NESTLÉ®, I pulled it off this time. Whew!! What do you do to simplify your life during the holidays?